I do school at home with my boys. They’re actually in an online public school, so it’s like homeschooling with certified teachers being the ones who give assignments, do the grading, Live Lessons on the computer and a whole lot more. It’s very structured, with deadlines and testing, just like the brick and mortar classrooms, but with the flexibility of being at home. It takes a lot of time, but I’m glad to do it. It’s been fun to watch the boys learn and listen to them read or talk about science facts knowing that I played a big part of their success. Because of this, I don’t have a lot of time during the day to bake “extras.” I always figure if I can get dinner on the table around 6:00pm, (Or honestly, even know what I’m cooking for dinner by then!) I’m doing pretty good! But it was Friday night. School was done for the week so I felt like I could take the time to bake something fun! Plus, my mother-in-law was staying with us for awhile, so I thought she might appreciate a sweet treat after dinner that night. Chocolate chip cookie bags, a modern one from my pantry and an old package found folded up in Grandma Dora’s recipe box. 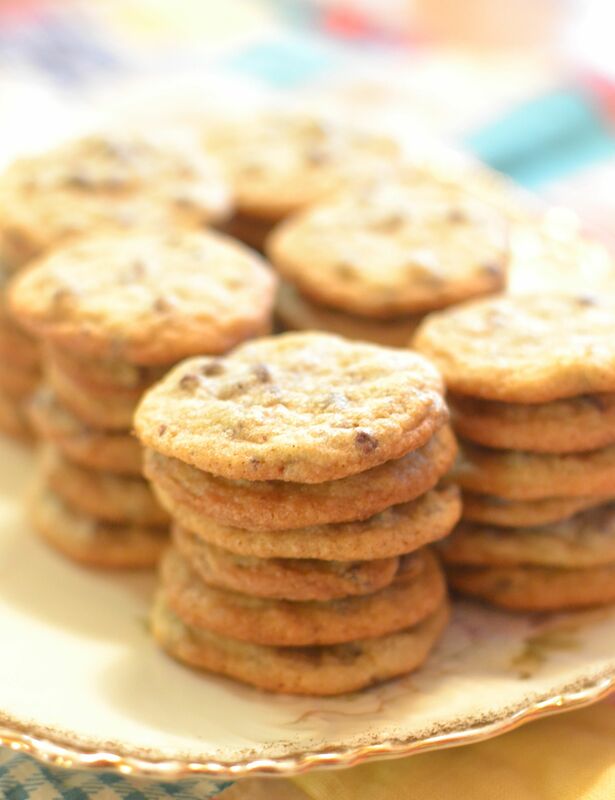 Who doesn’t love chocolate chip cookies? Chocked full of ooey-gooey goodness, when they’re warm and melting in your mouth! 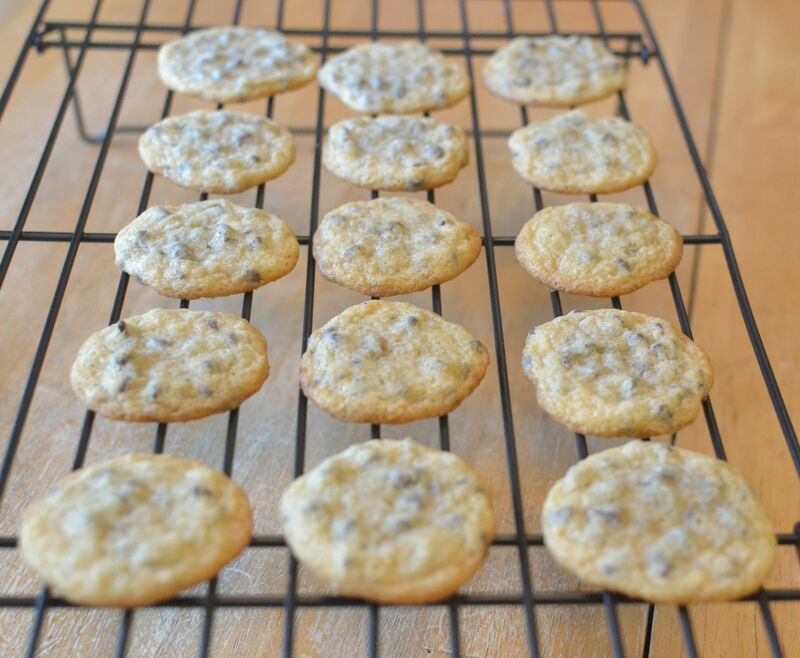 They’re possibly the most common cookie because of their deliciousness and Nestle’s Toll House is probably the most common recipe. (Though I’m not sure that I had ever made them before!) I was so excited when I found this old bag folded up inside my Grandma Dora’s recipe box. She had obviously saved it for the recipe that was on the back. It was so adorable and petite. I grabbed a bag out of my own pantry to compare them. I debated on making these cookies for the blog because of how common they are, but because I did find a few differences in the recipes, I decided to give them a try. It is interesting to see the differences between the two bags, now and then. Probably the most noticeable was the size. My Grandma’s bag was only 6 oz while mine was 12 oz. I figured the recipes were exactly the same, but surprisingly there were a few things that had changed over time. Chocolate chip cookie recipe on the back of Grandma Dora’s bag. Cream butter and sugars. Beat in egg. Add soda, flour and salt. Mix together. Add a few drops of hot water. Mix until well blended. Add chopped nuts, chocolate chips and vanilla. Drop by the half teaspoonfuls. Bake at 375 degrees for 6 minutes. Makes 50 cookies. I started by creaming the butter and both sugars. Then I beat in an egg and added the flour, soda and salt. The next, small step in the recipe was the part that was a little different from the “modern” bag in my pantry. I was to add a “few” drops of hot water. I did just that. It did make the dough more creamy or sticky. Next I poured in my bag of chocolate chips. (I buy mini chips because I think they’re more fun! Plus they turned out to be the perfect chips for these tiny cookies!) I added vanilla, but skipped the nuts this time. I had doubled the recipe, so I added my whole12 oz whole bag of chips. 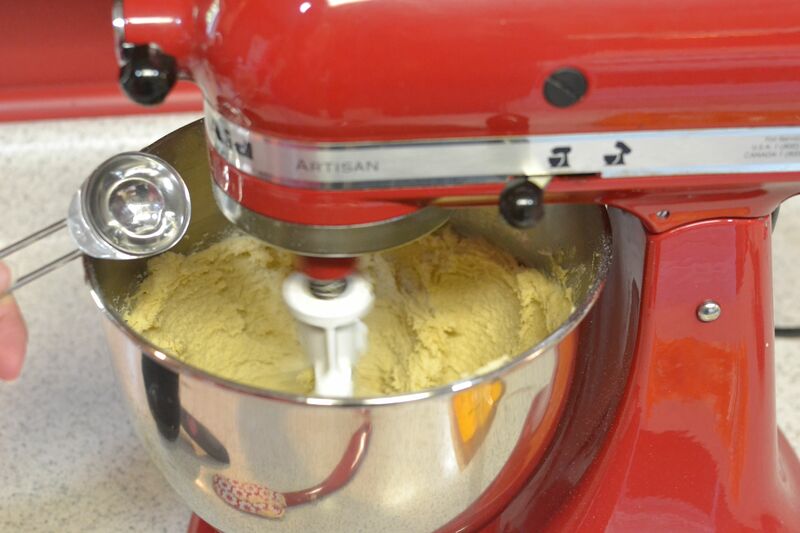 The dough looked beautiful. Next came the fun part, putting them on the trays! Here was the other difference that I had found between the new and old recipes. 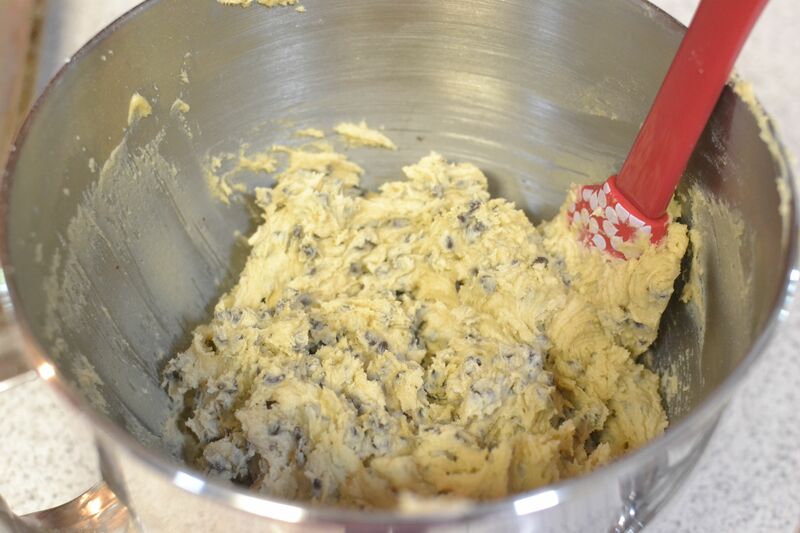 This recipe said to drop the dough in 1/2 teaspoonfuls….What?! Have you looked at how small a 1/2 teaspoon is?! I had to consult with Amy on this. I just wasn’t 100%! After discussing it, I decided to go with it. After all, it was written on the recipe. 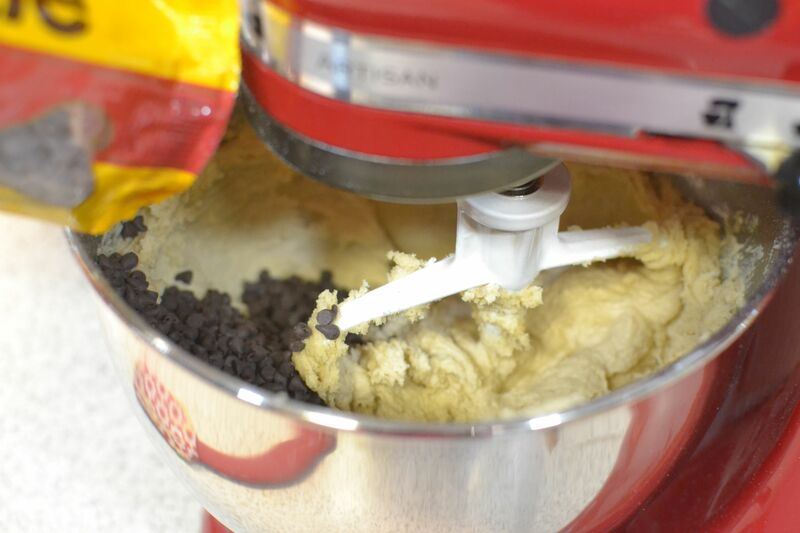 I used my measuring spoons to measure out the small amount of dough. I couldn’t believe how tiny the balls of dough looked compared to what I usually make when I bake other cookies. 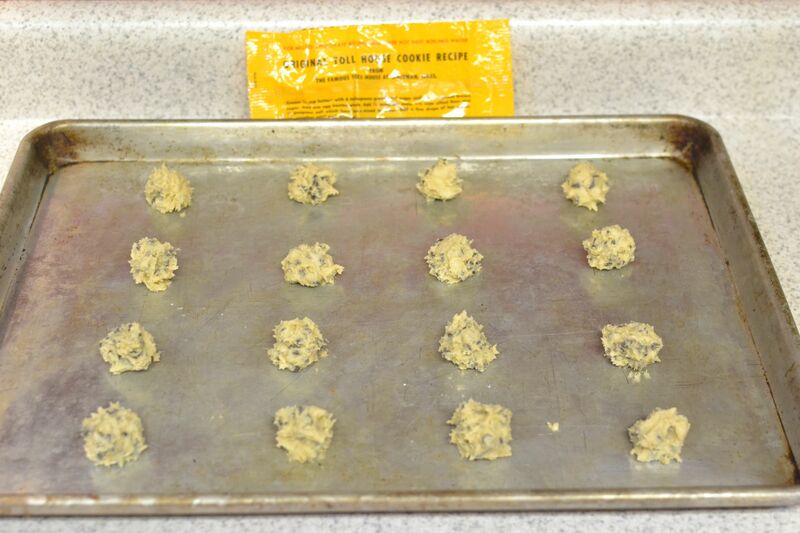 On the bag, it said to bake the cookies for 10-12 minutes. I thought that sounded WAY too long for the size of the balls of dough. I was imagining that they’d come out like little hockey pucks if I left them for that long! I timed them for a few minutes at a time and decided that 6 minutes was the perfect time, much less than what the recipe called for. I pulled them out, let them sit for a minute on the tray and then transferred them onto cooling racks. They were so cute! I never would have thought to make cookies so tiny. I was really happy that I had decided to go with what the old recipe said rather than making them big like the “modern” recipe said to do. They were delicious, too! They were soft, but with crisp edges. My oldest son told me that they tasted like they were professionally made! Maybe the secret was in those few drops of hot water and the petite size. I think my Grandma Dora was on to something, keeping that package stashed in her recipe box all those years. My mother-in-law did enjoy the bite size cookies after dinner that night and lunch the next day too! I’d see her “sneaking” them after other meals as well! I was happy I had decided to make them so she could enjoy them during her stay with us. 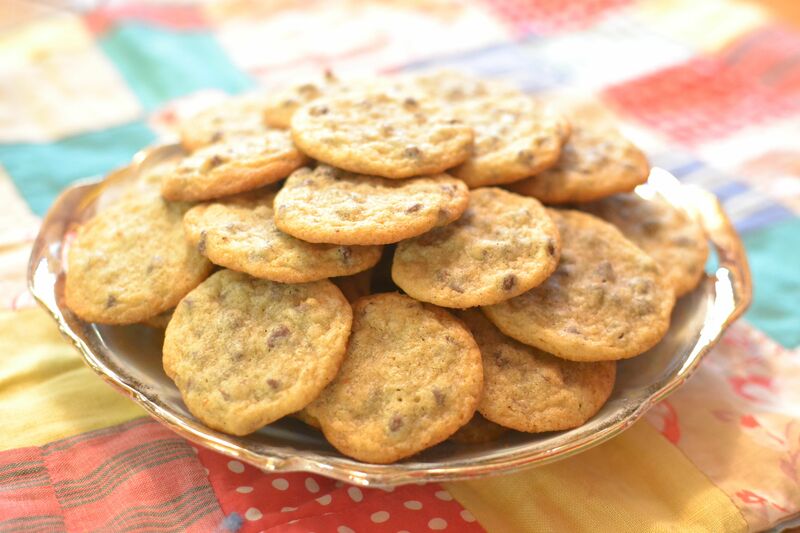 This entry was posted in Cookies and tagged baking, Chocolate Chip Cookies, Chocolate Chips, Cookies, dessert, farm cooking, grandma's cooking, homemade, scratch cooking by GrandmothersRecipeBox. Bookmark the permalink.